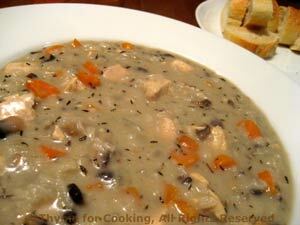 Easy Dinner from Thyme for Cooking: Chicken Mushroom Chowder. Our first soup of the year, and an easy one to start. It takes good advantage of the seasonal mushrooms and makes enough for 2 meals... Perfect for autumn! I used chicken breasts, but thighs would work as well. Either way, used skinned chicken to save on fat and calories. Because everything is sautéed briefly this is a quick-cooking soup; because it's a chowder, it's very thick. Add more stock or milk if you prefer it thinner. This is enough for 2 meals or 4 persons. Clean and roughly chop mushrooms and carrots. In a large saucepan heat butter and oil over medium heat. Add chicken and sauté 2 minutes. Add garlic, mushroom, carrot and rice and sauté 3 minutes. Add flour and sauté 30 seconds. Slowly stir in chicken broth, stirring constantly. Bring to a boil, reduce heat, cover and simmer 20 minutes or until rice is done. Uncover, stir in milk and heat through. Serve. These are the easiest 'bread' possible to make. The only things to remember is not to whisk too thoroughly (it makes them tough, lumps are okay), and eat them hot from the oven slathered in butter.... how hard is that? Butter muffin pan - even if it is nonstick but not if it's silicone. Add remaining ingredients and whisk lightly - do not try to get out all of the lumps - doing this would cause over beating and tough popovers. 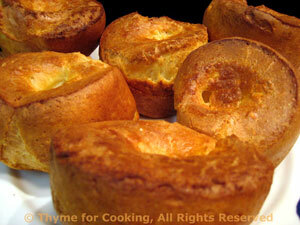 Ladle into muffin pan - cups should be 1/2 - 2/3 full. After 25 minutes turn temp down to 350F (180C) and continue baking 15 minutes more until nicely browned.